We have a client that has reached critical mass with their QuickBooks (QB) 2008 installation. They have been running on QB 08 for about a month now. There were some static issues at one workstation that caused some hiccups in the company file. They were rectified by running the built-in utilities to clean up the data files. Today, they were running some cheques and noticed that the numbers were wrong. Upon further investigation, and a long support call with Intuit, there are a large number of dropped deposits, invoices, bill payments, and more in the time period since the upgrade to QB 08. Apparently there are some known issues in this new version according to the Intuit support technician our client was working with. These issues are also a part of the built in QB 08 backup system. So, they cannot go back any number of degrees. We call it the First Version Blues with the customer being the "beta code" tester on the front line. Only in this case, issues with the product could end up costing a business its livelihood and possibly its life. In this case, our client has a good backup in place of their QB 07 files. We will be backing them off to QB 07 on the advice of Intuit! Lately, we have been putting in some extremely long hours. In our company, we have a policy that we do not work Sundays unless there is an absolute need such as a weekend install or emergency. We have not been able to maintain that rule as a result of the many client deadlines that required huge preparation beforehand over the last three weeks. Yesterday was the first day we had no critical client needs in that time period. So, we rescheduled anything that needed to be for that day and shut the shop down for the full day. For those of us who are reward oriented, having a full day off with pay is definitely a neat surprise. Perhaps, for us smaller shops this type of reward is easier to do. But, one can also reward one's hard working technicians in larger organizations with the same. When we run our own small business, it is very important to recognize poor performance as a result of fatigue. It is not too difficult for smaller shops to get caught up in client needs while forgetting the health and well being of our employees and ourselves. Even then, the best of us can reach the edge of burn-out without realizing it until it is too late. So, even though we have more client deadlines to deal with, we take the opportunity to rejuvenate, regenerate, and refresh our selves by doing other things. And that is very important: No reading tech or researching tech! The time should be for other things: Like spending time with our family, significant others, or some sort of leisure activities. One of the worst warranty replacement experiences for us ever was when we needed to replace a defective Intel SE7505VB2 on a production SBS 2000 server. Needless to say, things did not go very well. We made sure to have the replacement board's BIOS level and settings identical to the outgoing board. Once we had things back together and the OS was booting, we hit a BSOD ... and hit a BSOD ... and hit a BSOD. Nothing we did brought the server back. We even put the defective board back into the system (on board RAID controller was flaky) and tried to get the server back up. We ended up spending a huge chunk of time in recovery mode to bring back that SBS 2K server. This time around, there was a little of that "once bitten" fear for this particular project. We are working on a 2U, SR2400 series chassis with the SE7520JR2 board in it. The board's USB ports are done for. Nothing USB would be recognized in the OS. Once we swapped the board out, we booted the system up and were greeted with a BIOS beep code of 3. This error indicates a problem with memory. We reseated the 4 x 1GB Kingston sticks of RAM and tried again. Still, we received the 3 beep code. We ended up pulling 2GB out of the server to see if that worked and it did. For whatever reason, Intel shipped this board to us with the factory original BIOS installed once we were into it. So, we booted to a USB flash drive with the current BIOS on it and flashed away. After booting back into the new BIOS, we changed the settings as appropriate and rebooted again. We shut the server down as soon as we saw the POST screen. In went the extra sticks of RAM. After firing up the server and the diagnostic LEDs started dancing we knew we were in. And, our USB ports are now working. Most of us operate on the same level: It is the little things that can make or break any kind of relationship. The business relationship is not any different. Microsoft Small Business Specialist (MSBS) designation. MSBS Logo on our proposals, quotes, correspondence. Calling "quiet" clients to check up on things and see if they need anything. Picking up that box for warranty work at no charge. Passing along some of the NFR software and Swag that we receive from vendors to our clients. Removing all of the boxes and garbage associated with a delivery of product or products. Taking the time to make sure we haven't missed anything before leaving by checking in with our client contact and their users. Being there Monday morning after a weekend fresh SBS install or major upgrade to train on the new system or facilitate the transition to an upgraded system. When a technician or technicians are on-site, it is very important that they leave the locations they visit at least in the same condition as they found it. Even better, they make sure the client locations are better organized and cleaner than when they first arrived. This principle really comes home when we need to walk into a new client location where the previous I.T. shop's technicians left a total mess in the server closet and in and around the network. One can tell a lot about the professional by the condition of their tools, their vehicle, and the condition of their client's products and projects after they finish working for that client. The school of "Good Enough" just does not cut it here. The Barn Identity is a previous blog post that delves deeper into personal professional presentation and self, employer, and client respect. Ever get one of these calls: "Hi, my laptop won't power up. I can't seem to do anything to get it to start". While it does not happen too frequently, it does happen, and there does not seem to be a limitation to one manufacturer. The only fix for this problem is to pull the battery and the A/C and leave the laptop sit for about 5 minutes. After the time period, plug the A/C in only, and press the power button. The laptop fires up with no issues. Once the machine is up, have the user power it down, then plug the battery back in. They should be good to go from there. We have seen Toshiba, Acer, Lenovo (today's call), and others do this. There is a registry setting that one can change to enable or disable the Num Lock key for the user at the logon screen. For users on desktop PCs, setting this value to 2 in order for the Num Lock key to be lit before logon is generally a good idea. For laptop users however, the opposite is true since in most cases the "number pad" is embedded on the actual user's keyboard. Thus, when the user goes to logon to the network, they get an unexpected character from that section of the keyboard. It also gets a little annoying to have to use the Fn key on the laptop every time they logon to turn Num Lock off. For laptop users, we set this key to "0". One of our Acer laptops came back from a visit to the warranty depot with this setting enabled for some reason. From the Microsoft Knowledgebase: How to enable the NUM LOCK key for the logon screen. We are in the process of updating the firmware on a client's SS4400-E NAS device. The newest firmware gives us a number of enhanced features, with the essential one being the ability to plug in 1TB drives. Download the 1.4 firmware file from the SS4000-E Download Page . Extract the files from the downloaded file and save them to your hard drive on your laptop, desktop, server, etc. Unplug all hard disks installed in the Intel® Entry Storage System SS4000-E system. NOTE: this will display the system initialization screen, not the login screen. DO NOT insert the hard drives. After the previous step completes, the system should be rebooted but without the disks inserted. After the system completes the boot sequence, the disks can be inserted (one at a time while the system is running and wait for the disk LED to illuminate) and scanned for (scan for each disk after the LED illuminates) and the firmware reinstalled. If the firmware package is installed and the disks are reinserted prior to rebooting the system, the system will boot off the drives and not properly complete a clean install. The drives must be inserted while the system is running for this process to complete properly. Note that the firmware update process takes a quite a while. Also, once one logs in at the Management Web page, the NAS will have picked up a set of IP addresses from the internal DHCP server again. So, make sure to reset the workstation's IP back to DHCP after step 7. All in all, the process went very smooth. We will also now be utilizing the Active Directory integration on this particular NAS unit to manage user access. This feature simplifies data and folder permissions leaps and bounds over the built in Samba share structure. Part of what distinguishes us as professionals is in the way we do things and how things end up when we are done. We keep extensive check lists (a blogged SBS example) for all aspects of the work we do. We keep WSS based folders available for our technicians to upload screenshots to along with some notes on them for later addition to the Wiki. Our policies and procedures (P&Ps) are well documented and available to our technicians all the time. Our technicians can comment on those P&Ps, updating the P&P Wikis on the go. No matter what SBS fresh install we do or SBS install we walk into after the fact, our workstations, servers, shares, and other infrastructure aspects are as similar in their structure and appearance as we can get them within reason. Maintaining consistency makes it much easier for any of our technicians to walk into a situation blind and know with relative confidence what is going on at any given client. This is what distinguishes a professional from the one who flies by the seat of their pants. We have been using Vantec NexStar 3 USB 3.5" HDD enclosures with our backup solutions for a long time now. Just recently though, we have hit a snag: With the NexStar plugged in and turned on, we go to warm boot a server with an S3000AH based server board setup and the server hangs. Cold boot the server and head into the BIOS to make some changes, save them, then warm boot the server and it also hangs. Vantec recently went through a product revision with their NexStar 3 USB HDD 3.5" enclosures. They are a mirror image of each other. One would assume that the differences in the amount of electronics would be offset by some of them being located on the backside of the PCB on the new unit. This is not the case. So, we are now in a quandry as we have at least a dozen of these new units either in the field or sitting here in the shop waiting to be delivered to our client sites. For now, we have been in touch with our supplier to indicate to them that the units are seemingly defective. We will also be looking into an alternative enclosure right away. We have sent an email into Vantec's support and, when we have a little more time, we may get in touch with Intel about it. For now though, the problem is definitely in Vantec's court. UPDATE: Vantec has responded already! We provided some more feedback as well as sent a link of a short video of the two problem scenarios we experience on an S3000AH based 1U sitting on our bench in the process of a Swing Migration. Kudos to Vantec for being so quick to respond! UPDATE 2008-01-28: It now seems that we can include the Intel S5000PSLSATAR series server board in this situation. We helped out on a new SBS install utilizing that board with dual Xeon 5345 Quad Core processors this last weekend. The server hung on reboot with the enclosure plugged in and turned on. We sent a note off to Vantec's tech support to update them on the situation. We have also ordered in an alternative enclosure made by Thermaltake: Silver River DUO Enclosure. The key feature on this unit is the ability to flip a switch on the back to choose between the USB 2.0 or eSATA interfaces. We have yet to hear back from Vantec. Now that we are seeing this issue on more than one server board, when we have more time later this week we will be initiating a support ticket with Intel too. UPDATE 2008-02-01: We plugged one of the new sled based NexStars into an existing SE7230NH1-E based Pentium D SBS box as part of this particular client moving over to a ShadowProtect based backup solution. In this case, the SE7230NH1-E does not hang up like the S3000AH or S5000PSLSATAR boards do on a warm boot. UPDATE 2008-02-05: We just plugged a new sled based NexStar into a server with the Intel SE7520JR2 server board in it. We warm booted the server after some updates and configuration changes and there was no issue. The hard drives in the enclosures are all Seagate hard drives with at least 320GB of storage capacity. All of the Seagate hard drives have the 150Gbps jumper removed (Previous blog post). Occasionally, Symantec is the product of choice for a client. Setting up an SBS install for this weekend, we registered the client licenses for Symantec's new EndPoint Protection Suite and proceeded to download the files. WHY INSTALL THIS YOURSELF? LET US INSTALL IT FOR YOU! 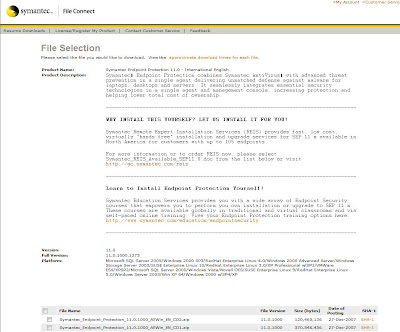 In some cases our clients have registered and downloaded the Symantec products. Where would something like this leave us if they decided to pursue Symantec's install service? Out in the cold. Given our most terrifying moment of 2007 (previous blog post) was relinquishing control of a key system in our organization to one of Symantec's "Experts", we can only wait and see how this service actually works out. Unfortunately for Symantec, when one of our "partners" begins to compete with us, we will walk away from them and their products if at all possible. In this case, the walk away process has already been started, with this situation only adding further evidence that we have made the right decision. A long time client brought in a PC that was only a month old from their local church. Things were not running properly on the system and they wanted us to clean things up. The system booted into Windows XP with no issues. We cleaned up the user setup, set security on the user profiles and the Line of Business (LoB) applications, and checked into the partitioning since there were two partitions on the machine with My Documents and their key LoB application moved and installed on the second partition respectively. When we opened the Computer Management console and checked out the Disk Management console the partitioning was particularly strange. The OS sat on a small C: partition at the beginning of the drive and the D: partition sat at the end of the drive. There were two unknown partitions in between. Our client did not know what they were and, given the newness of the system, knew they were not supposed to be there. So, we deleted them, restructured the two partitions to take up the unused space and continued on our way. When we rebooted the system after some updates though, we found out that there was a little more going on than a goofy partition scheme. Upon seeing that, the light came on upstairs: Linux. How Linux was installed on the new machine was a mystery. How to get our Windows XP back was also a bit of a mystery. A search on the Web brought us to instructions that we already knew: We needed to reset the MBR (Previous blog post). Once we reset the MBR following the above instructions, we were greeted with the Windows XP boot screen and eventually the OS desktop. Needless to say, access to that machine will be restricted and monitored from now on! We have taken the next steps in our severing our business relationship with Symantec: We have registered with Trend Micro's Partner Program. We started this process earlier this week by phoning the Trend toll free number to inquire about some part numbers and the person we spoke with pointed us in the direction of the Partner Program. We eventually received a call from Casey, who in turn answered all of our questions and provided a good bit of background information on the Partner Program and what it has to offer us. She then emailed us with further information and links to relevant Partner resources. So far, the conversations with our initial contact in the company and subsequently Casey in Distribution Channel Support have been refreshing. It is good to talk to someone who knows their company's products and is quite competent at their job. This is a huge step over the Symantec front line on the other end of their Corporate/Enterprise phone numbers. One of the benefits of the Partner Program we will take advantage of immediately is the ability to obtain NFR versions of their products. This will provide us the means to work with the products we intend to install and support at our client sites. We should receive our NFR keys pretty soon. Once we do, we will download the software and begin our adventure into Trend's security products. We recently finished installing an XP downgrade on an Acer laptop. It took a while to discover the correct keywords to use in our search for a solution. After the system was rebooted, the IE icon was as it should be. Thanks to the Neowin Forums: Start Menu IE Icon for that fix. Fix is near the bottom in a post by leggom. We just discovered what a "Forced Transaction" is to the credit card companies. We received an email from Symantec indicating that our subscription was automatically renewed. However, we do not have a subscription to any Symantec products. We have purchased them for some of our single seat clients or non-profits, but only for the year. Or, at least we thought so. When going through the various purchases that we do in this manner, we are pretty careful about such "automatic" settings. Perhaps we missed this one ... it is sure a lesson to be a lot more careful in the future. When we called the credit card company to enquire about the transaction - the original card's expiry was long gone - we were told that the credit card company allows for subscription services to be "Forced" through despite the expiry date on the credit card! This information was really surprising since one assumes that upon a credit card expiring, any associated recurring transactions would no longer apply. This is obviously not the case when it comes to ongoing subscription type services. The credit card company contact was not the least bit surprised that Symantec was the culprit. It seems to be a quite common experience. The credit card representative recommended we contact Symantec Support and ask them to reverse the charge. They also recommended that we save a transcript of the conversation (we used the chat feature), just in case the charge reversal does not go through and we need to initiate the payment dispute mechanism at the credit card company. In a business we have to reconcile all of our various statements, so things like this tend to be caught in smaller organizations. What happens to those who do not pay too much attention to their credit card statements? They get billed for a product they very well may not be using anymore! What happens to larger organizations that may not pay attention to every single transaction going through their books? They pay too. 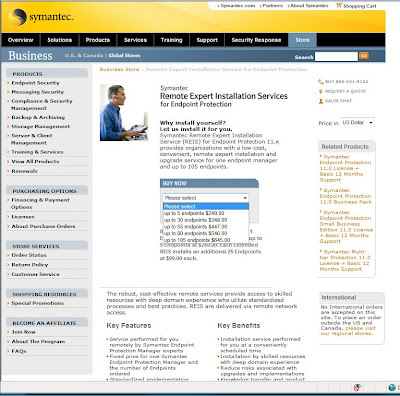 Symantec indicated that they would reverse the charge and discontinue the "subscription". We now need to wait 2-3 business days for the transaction to appear on our credit card. Nothing seems to have fixed the issue short of a reboot. Shutting Outlook down as well as killing its process in the Task Manager did not do it. Cancelling the Send/Receive and clicking on the S/R button or F9 on the keyboard does not always bring in new email either. Given time constraints, a reboot has not been possible since the last one. We need to get some work done on this machine! So, hopefully the reboot, when it happens, will fix it for now. The machine that Outlook is misbehaving on is due for a significant component upgrade. So, the OS and all applications will be reinstalled to see if a start from OS Ground Zero will resolve the Outlook issues on it. UPDATE 2007-01-17: Tried ripping Office 2007 right out of the system and allowing our GP install to run fresh. Problem is still there after the reinstall. 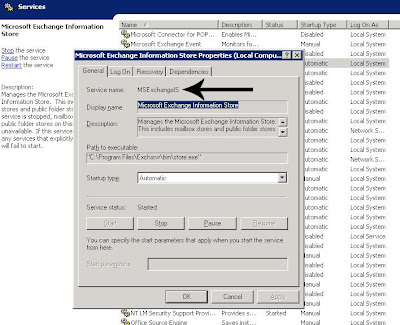 There are a number of other workstations here that can connect to that Exchange profile with no issues. The one difference is the POP3 pulls that happen on the one workstation with the problem. Yet, the POP3 pulls are accomplished with no hang ups. Only the Exchange portion seems to get hung up indefinitely. 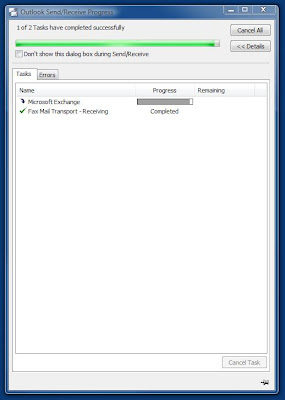 Service Pack 1 has been deployed via WSUS and all workstations have it installed. We picked up three new Lenovo T61 from a client to prep them with their Line of Business (LoB) apps and for installation onto the client's SBS network. The T61 comes with Windows Vista Business out of the box, so we were also going to downgrade them. When we received the boxes, we did some research on the downgrade process. We erroneously picked up on some forum posts that indicated that we were required to call Lenovo to order the downgrade CDs. Lenovo support was very straight forward. After obtaining some product codes off of the box they sent us the CDs no questions asked. When the disks arrived - all eight of them - we opened up the T61 boxes to have a look at the laptops. Originally we planned on making copies of the disks to enable us to run all three laptops at the same time. This was not necessary since we discovered that the laptops also came with their own copy of the recovery CD set. The first thing we noticed was that the set that was sent to us by Lenovo were stamped "Recorded in the USA" as opposed to the set that came in the box with the T61s that was stamped "Recorded in Hong Kong". Okay ... so, is there a difference in the image contents too? Technically an image should be an image. So, we downgraded two of the laptops using the in-the-box media (referred to as HKs) and one of the laptops via the media that came directly from Lenovo (referred to as USA). The first difference was abrupt: After running Rescue & Recovery 3 via the first recovery disk on USA and starting the "recovery" process to factory defaults for the XP downgrade we were prompted to reboot the system to continue the process. The reboot happened without a problem. The HKs on the other hand both erred out on the reboot request in what seemed to be a disk format utility error. We were offered the following button options on the error dialogue: Cancel, Retry, and Ignore. On one we clicked Retry which hung the system indefinitely and required a hard reset (hold the power button for about 10 seconds). On the other we clicked Ignore which caused the machine to pause for about half a minute before rebooting itself and continuing the recovery process. No ill effect seemed apparent after this though. Once the three laptops finished their post recovery initialization, they seemed to be the same desktop wise, but there were some initial subtle differences. The HKs would pop up OS information bubbles at the same time while the USA would not. There were a couple of post SBS domain Windows Update hiccups on the HKs where the USA seemed to accept the changes and run through the Windows Updates smoothly. There were a number of other anomalies associated with the LoB apps too. The LoBs installed with little or no issue on the USA but set themselves up differently on the HKs which was really odd. We saw some errors out of the LoBs on the HKs that we have not seen in years from those particular applications. When it came time to run the Lenovo built in software updates, all three were asking to download 1.6GB each or more! That, in and of itself, is pretty scary ... especially for those who are charged by the bit or in our client's case, have a small bandwidth Internet connection. Also, keep in mind that two of the updates required by the Lenovo software are two Windows XP hotfixes that should be applied before adding the T61s to the SBS domain: Lenovo (& Others) XP Specific Updates: Hotfixes required via Product Support Services (previous blog post). If the hotfixes are not applied before adding the T61s to the domain, one needs to log on to the unit as a domain admin before the hotfix will allow itself to be installed citing insufficient admin rights. Having recently placed our first Windows Vista client into one of our accounting firm clients, we are discovering all sorts of interesting hiccups. One hiccup is with the Kingston DataTraveler Secure - Privacy Edition. Every member of the firm is required to use this device when carrying around client data. This keeps the client data protected by a strict password and hardware encryption. On Windows XP Professional, the flash drive works really well. On Windows Vista however, the security software stalls. Essentially there are two partitions on the flash drive: One that mimics a CDROM and spools up the software to access the second partition that is hardware encrypted. Even if we allow the software on the "CD" partition to run when prompted by Windows Vista, it stalls. It turns out that there is a Kingston support entry for this problem on Windows Vista: Issue: KTP-012210-3 After inserting the DTSP into a Windows Vista computer, I received an error stating, "DTSecure Privacy requires two free drive letters.". To resolve the error, we need to update the firmware on the DataTreveler. We contacted Kingston's Technical Support and were directed to a password protected FTP site with the appropriate firmware update. Note that the firmware update will format the encrypted partition, so make sure that no data resides on the DataTreveler before updating it. Once the firmware was updated, we needed to run through the setup routine to set the access password and user information to the flash drive. This is the link on TED: Blaise Aguera y Arcas: Jaw-dropping Photosynth demo. In an era of Web 2.0 and "Social Network" hype and circumstance, this video is quite refreshing. We get to see Blaise run through a very stunning demonstration of the product he is the architect of: Photosynth. The product is totally "social" in its abilities to pull hundreds if not thousands of images together based on a keyword search that incorporates all of the image search result's meta data. 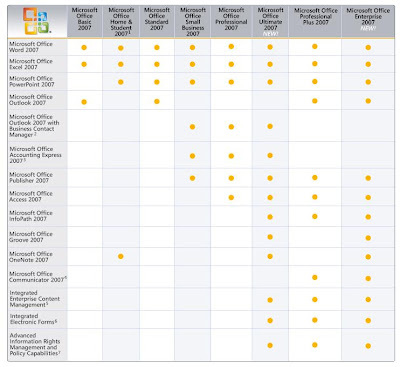 The usage models for this product are truly amazing in their breadth and probably the significant reason why Microsoft, wisely in our opinion, purchased the company in 2006. This is a link to Blaise's Bio: Blaise Aguera y Arcas: Software architect. We have not looked at the update directories for WSUS version 3 on SBS in a while. This evening we are completing an SBS Swing and got the chance to size them up ... and they are large ... in the order of 40GB large. The size of the update directories are definitely something to keep in mind when evaluating an older SBS box for WSUS 2.x or 3.x or an in-place upgrade to SBS R2. With the advent of Office 2007, Windows Vista, and soon Windows Server 2008 we can probably expect to see WSUS update directories into the 100GB+ magnitude. That is definitely something to keep in mind when future planning a server configuration. We are moving away from Symantec. In one case, we have a relatively new install at a long time client who moved offices and needed a fresh start. It is now almost 18 months later, and we have finally worked out getting the Symantec licensing .slf file problems worked out ... almost. The management console keeps telling us that certain clients are in license violation mode and won't update the client's definition files when this happens. And there are seemingly no good answers forthcoming from Symantec ... even with the Gold Support. *sigh* and a deep breath. So, we are going to try out the Trend Micro NeatSuite with a new client. Trend's name passes through the RSS reader every once in a while. Sometimes good, and sometimes bad, but from what we can tell, a number of leading SBSers out there rely on it for protection. What this means is a heavy investment of time to learn a new product. Hopefully the Trend setup will be fairly straight forward. By the way, we did look into ForeFront Client Security as a possible option, but the management console requires a full version of SQL2005 server installed. SQL 2005 Workgroup on SBS 2K3 R2 Premium does not cut it. Even on the Open Value Licensing scheme it was too expensive for SMB to include SQL. While we can install the workstation client in a "not managed" mode, this does not strike us as the right direction to go in a server/client environment. And, in the case of our existing clients, once their Symantec licensing lapses we will move them over to Trend. All I can say is Finally! and Whoo Hooo! We will be seeing the Zune here in the spring according to CBC: Zune to launch in Canada this Spring. You can bet that we will be ordering a number of them for our office and household as soon as they are SKUd up at our suppliers. Why have we waited for Zune as opposed to jumping on the iPod ship? Primarily because we all have a vested interest in keeping the industry healthy by providing competition to Apple. And, it would be nice to carry around a Microsoft hardware product while visiting our SBS clients ... as we are proud of the Microsoft products we sell and support. We have been working with a number of Windows Vista based Acer TravelMate 6592G and Lenovo T61 laptops. Out of the box, we fire them up and run through the Windows Vista initialization which can take anywhere from 15 to 45 minutes depending on the speed of the system. We do that for each new laptop we receive on behalf of our clients. Once the initialization is finished, we create the Windows Vista recovery media for our archives. Initially, laptop manufacturers were not necessarily providing the ability for us to easily downgrade the Windows Vista installation to Windows XP Professional. We had to install an OEM copy of Windows XP Pro, then download and install every component driver which could be a hit and miss affair. Fortunately, that has changed lately. Both Acer and IBM are now supplying a set of recovery disks to downgrade the laptop to Windows XP Pro. That is no simple feat either. The manufacturer essentially has to double up on image creating for each Windows Vista model. Now we can essentially babysit the system to change disks as the Windows XP Pro recovery media runs. While the cost of providing the downgrade disks can be distributed across hundreds of thousands of units for the manufacturer the same cannot be said for our clients. So, this is definitely a step in the right direction for all concerned. My apologies to Microsoft for the previous post ... I was wearing my "Rose" coloured glasses of frustration. Microsoft, I do believe that we who support the SBSC/SMB clients have a request for you: Since we work through the holidays while our clients are down we suggest that any work of significant impact be done then too or at off hours to least impact your Partners. For us and our clients the holiday seasons or evenings/overnights are a time to accomplish the big projects like server migrations, upgrades, and other large projects. We then take our break sometime later in the off season. Taking down the licensing site on the first full working day of the year is not exactly the best way to work with us Partners. Unfortunately, we now have to wait on the phone for who knows how long before we can hopefully get the right answers to our Open Value licensing questions. We realize that once something gets out on the Internet, it is out there for good. So, this is a good lesson: Take a deep breath before hitting that "Send" button. :) The previous post has been removed at least from the blog. Things are really intense in here right now. We have a number of Swing Migrations on the go, a bunch of system setups, XP downgrades, and deliveries to take care of. So, things might be a little lite on the blog for the next little while. 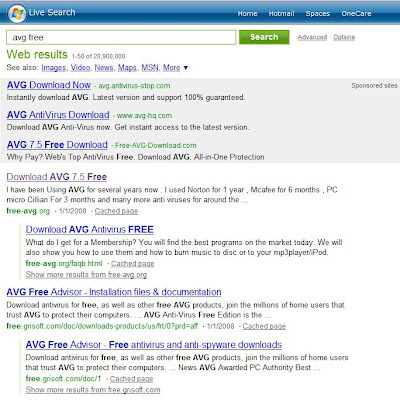 Note the link to "free-avgDOTorg" as the first result under the sponsored sites before Grissoft's Grisoft's site links. Note that the button includes the line to "Get Full Support" in it. The orginal AVG .org domain is protected by Domains by Proxy. This in and of itself leads one to be really suspicious as the original owners of the domain cannot be contacted at all. Go to the ordersignupDOTcom root page that is hosting the "Membership Type" page and one is lead on a wild goose chase that ends up on sites that also look like their sole purpose in life is to garner a person's credit card info. All in all, this is one very good reason to be "street smart" on the Internet and for companies like Grissoft Grisoft to be aware of what others are doing with their online reputation. UPDATE: Updated the spelling of Grisoft! UPDATE 2: Courtesy of Alex over at the Sunbelt Blog: Anti-virus vendor AVG subpoenas information on counterfeiters. My apologies to Grisoft for the inference above that they are not taking care of their reputation. It seems that they are, but as the article indicates, it is very difficult for them to follow through on it! 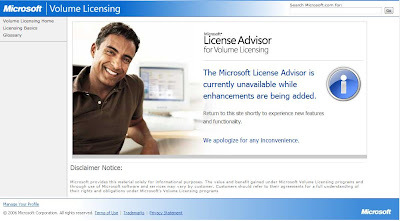 Licensing and AVG "Free" Edition in a corporate setting? Not say anything? Let it slide? Since we receive email from around the world, the motive to inform a client, or non-client, would be one of principle versus one of "getting the sale". We believe in operating our business and working with our clients' businesses above board. This means making sure that our client's licensing and our own licensing are in proper order for any software product installed on any system or device. Please note AVG's Web site states clearly that the Free Edition of AVG is for personal or non-commercial use only. We strongly suggest that Insert Company Name Here look into properly licensing a corporate level Antivirus solution. A proper solution would preferably be centrally (server) managed and not rely on the user to initiate updates or run scans. The proper solution would also be very difficult to circumvent ... which the free edition of AVG may not be. As a commercial enterprise, Insert Company Name Here would be liable for any virus spreading itself from within the Insert Company Name Here corporate network. There are organizations that track the source of all virus and Spam infections via IP and provide that data publicly. Thus, it may not be too difficult to trace back to the original sending organization. Also, a software audit by CAAST of Insert Company Name Here would turn any system the "free" software was installed on into a very significant monetary liability via fines and more. In most cases, we get "Oh ... we did not realize that" or "Thanks for pointing that out". We carry this policy into any prospective client relationship as well. If we are assessing a prospect's network and there are licensing issues, we make a point of documenting them and then discussing the issues with the contact there. If there is a firm and in writing commitment to address those issues within a fixed time frame then we will continue working with them. For those instances where cooperation is not forthcoming, the Microsoft Partner Site has some great legal resources and people to talk to. Consulting with them will make it clear where we would stand as far as our culpability and possible complicity in a prospective client's licensing quagmire and how we should proceed. For those who live and work in countries where litigation is flung about like a big stick, it is even more important to be absolutely clear where one's company stands legally.